Any longtime reader of this blog will probably be able to guess that I am not what you might call a ‘girly-girl’. So it probably won’t come as a surprise when I admit that I don’t own a whole lot of silver things that need to be polished. Nor do I like to spend a lot of time fiddling with unnecessary projects, like oh, vacuuming, budgeting, or polishing silver. The few things that I do own are precious to me, however, and are worth the three minutes of polishing annually needed to keep them shining. I have a couple of brooches, a pair of candlesticks and three silver cups, one for each of my children. So what’s the easiest way to keep silver gleaming, both frugally and environmentally? As my stepmother has often pointed out to me, silver doesn’t need to be polished if you use it. She and my father use their silver cutlery daily and, to the best of my knowledge, have never polished it. Or at least they haven’t polished it when I was around. Washing the silver in hot soapy water and towel drying it immediately after will keep it bright and tarnish free, if done on a regular basis. Our kids eat snacky finger foods like cheerios and raisins out of their cups, so the cups are washed on a fairly regular basis. This keeps them somewhat tarnish free, but occasionally they need a boost. 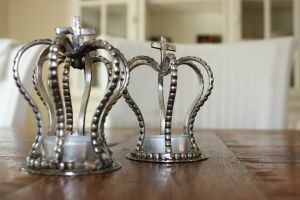 Nor am I about to wash my candlesticks daily, so another easy method is to make a paste of baking soda and gently rub it on. This works very well for larger pieces, or items like the cups that are to hold food. If you have a piece with a lot of engraving, and you would like to completely remove the tarnish, then try this chemical trick: use aluminum foil, water and salt. This can also be a fun experiment for your children to do, to help them learn about beginning chemistry. Another of my favorite tricks, especially if you want your silver to smell minty fresh and be gingivitis free, is to use a white toothpaste (not gel) to clean off the tarnish. This obviously works best with small peices, like earings or brooches, unless you’re willing to sacrifice a whole lot of toothpaste. It’s easy to use: rub the toothpaste on in small circles and then rinse well. Do you have any other homemade silver polish solutions? Or how about for other metals like copper or iron? This rocks, thanks for posting. I knew about baking soda/toothpaste but am excited to try the “experiment”! interesting… Haven’t heard of this method before.. I will give it a try. Oh, I don't own any silver at the moment, but I do use baking soda for many cleaning jobs and love how versatile it is! Next post: Welcome to Simple Mom Readers!